I mentioned earlier in the week the grass fed lamb I picked up at Farm to Family and in that same trip, Suzi educated me on the rabbit they were carrying from Tuckahoe Lamb and Cattle Company. Well I was not getting out of there without picking one up as I had not cooked a rabbit in a while and was excited to give braising a try. As stated on their website, rabbit is one of the healthiest, best tasting meats available —it's an all white meat, fine grained and can be substituted in any veal or poultry recipe. Rabbit meat is higher in protein, but lower in fat, cholesterol, sodium, and calories than any other meat. Besides this recipe kicks it! Wow! First of all — when you purchase your rabbit it does come whole and frozen, so if you are unfamiliar with cutting up a rabbit it is really quite simple. Here is a visual tutorial on how to cut up a rabbit from Saveur that I recommend. 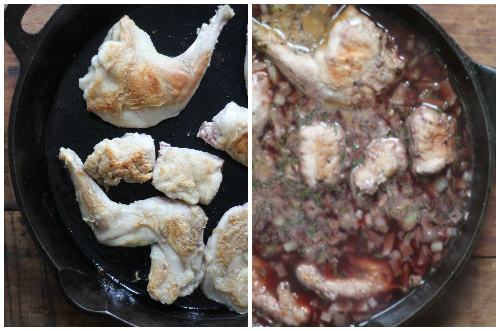 I adapted the following recipe from Epicurious and the only thing I did differently was placing the rabbit pieces in a salt water brine for about 6 hours after I cut the meat up. In a large bowl stir together flour and salt. Add rabbit and toss to coat. In a heavy skillet heat 2 tablespoons oil over moderately high heat until hot but not smoking — then brown rabbit in batches, transferring pieces to a bowl. Add onion and remaining tablespoon oil to skillet and sauté, stirring occasionally, until softened but not browned. Stir in garlic and rosemary and sauté, stirring, 1 minute. Add broth, wine, and rabbit with any juices and simmer, covered, 1 hour, or until rabbit is tender. Remove lid and simmer until sauce is thickened slightly. Stir in parsley. Bring water and salt to a boil in a saucepan and gradually whisk in cornmeal. Cook polenta over moderately low heat (it should be barely boiling), stirring constantly, until very thick and pulls away from side of pan, about 40 minutes for cornmeal and about 15 minutes for instant polenta. Remove pan from heat and cover to keep warm. Stir polenta just before using. Note: Polenta will keep warm, covered, about 20 minutes. Makes about 3 cups. Finally, stir sage into warm polenta. Serve polenta topped with rabbit and sauce. The sage polenta with the rabbit was quite amazing and you might ask yourself for white meat why does it look so dark? Well, it absorbs the color of the red wine and the flavor which really gives it that rustic richness. So be honest — have you had and cooked with rabbit before or did I persuade you to at least give this meat a try? If so, make sure you hop on over to Farm to Family and pick up some of this delicious alternative to veal or poultry! 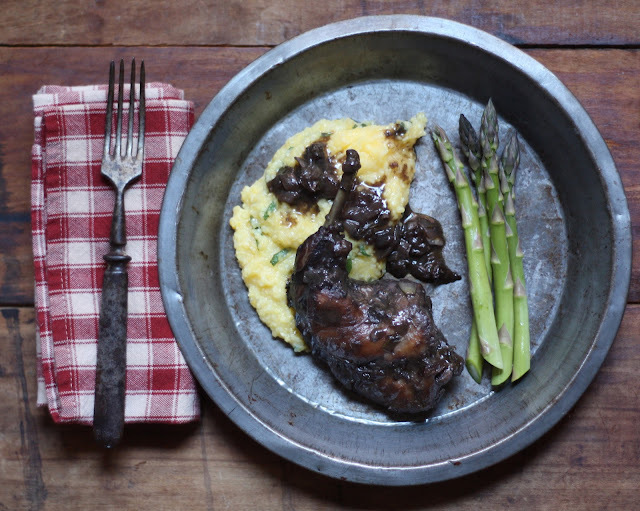 Thank you so much for sharing this amazing recipe and photos -- I love the pairing with rosemary and red wine on sage polenta. My dad, Adirondack woodsman old-timer/enthusiastic rabbit man/amateur chef, would be excited to try it. 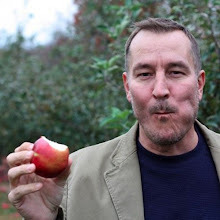 I can imagine him finding your blog (magically as he was pre-internet) - foraging his ingredients, and getting it all merrily bubbling away on his wood stove, in his favorite old beat up cast iron skillet. Then he would say in his gruff voice, "E.A.T. it...It's good for what ails ya." Thanks Suzi for carrying such great local product! Angie, I hope you can find some in Alaska! Really is a recipe to try! Ha, so sorry about that! Yes, I would not bother the neighbors. Thanks for the comical update! I have been wanting to try rabbit. Thanks for all the good info! Thanks for taking a look and this recipe is a wonderful way to get introduced to rabbit!